Many parts of the Demmel Documents contain information that’s been “storied” – translated into story form. Other parts are “direct paraphrases or translations” from…them. Without much mobility the Demmels are vulnerable to strong wind variations; they call them tornadoes. It happened in a small area in the north-central part of the country in the southern part of a place called Minnesota; more specifically a place named Freeborn County. It was here that several Tornadoes hit on the evening of June 17th. The following is a storied translation of a file pulled from the hard drive Wurdock discovered in 1987. A flag on the Borchardt farm twists rhythmically, sickly, in a wind that switches between mild and furious, every few seconds. The sky is a strange green over Jeff Borchardt as he directs a 4-wheeler towing a trailer of tools into a shed. The large, 45 acre farm has two barns, two tractors, an outbuilding, three grain bins full of corn and beans, and a house. A series of framed black and white photographs on the wall inside the house show the history of the farmstead; it’s been in the family for more than 50 years. Jeff steps out of the shed, looks around; he takes in the strange sky on the horizon, and it’s eerily quiet. Leslie runs dish water. She stops the faucet, pulls off her wedding ring and drops it into a jar filled with water and cleaning solution. She tightens the top of the jar just as a tiny hand reaches up and squeezes as much of her denim jeans as it can handle. Damien’s sister Misha stands in the living room, toys surround her bare feet. She stares out the window, at the dark clouds flying by. Several tornadoes are on the ground in Freeborn county. They roam rural farmlands like evil bullies, scowl-faced natural predators capable of annihilating an entire town, or leaving individual homes, individual’s lives, untouched. They curse along at 20 miles-per-hour. The largest is several miles wide. Inside the twister, million dollar pieces of farm equipment float around like feathers; there’s also wood from trees and homes, huge slabs of metal shrapnel, single corn cobs jetting around fast enough to kill a Demmel, and more. There are living things inside this tornado; chickens, pigs, even a cow. But you can’t hear them. When sufficiently scared, all living things seem to go quiet, and being stuck in a tornado is one of those fear-producing events. These animals make none of their signature squawk, oink, or moo sounds. Tornado sirens ring out several miles from the Borchardt’s farm, but they don’t hear them yet. Inside Jeff is on the phone, as Leslie, Misha and Damien eat at the kitchen table. “Yea I think we’re going to just hold up here, hit the basement if it comes our way.” Leslie is concerned. Jeff clicks his cell shut. “What did your dad say?” Leslie asks. Leslie anxiety shows. “Do you think we should go to their place? “Ok, alright, we’re leaving now,” Jeff says. “To Grandma’s house.” Jeff answers. A few minutes later, Leslie, the last one out of the house, holds the door. She takes one last I-don’t-want-to-forget-anything look at her kitchen. Content, she closes the door. Her wedding ring still sits in the jar on the kitchen counter. “Crack!” “Snap!” “Thwack!” Trees snap loudly in two like giant toothpicks and corn stalks disintegrate in a fraction of a fraction of a second. The tornado was dark, full of things it’s already destroyed. Wind. Scratching. The debris clanging together is the nasty melody to a chorus of devastation. It’s not just a funnel cloud. It’s an EF4 tornado. According to one Demmel, “It’s a get the hell out of the way, or you are going to die” sight. It’s ominous, angry, and not willing to spare any thing, or any one in its path. A young man – Adam, Jeff’s brother-in-law, sees it all through a set of binoculars. First it munches the Borchardt’s 350-thousand-dollar tractor. It picks up the giant machine like confetti on a picnic table at a windy birthday party. It destroys acres of crops before fixing itself on a barn; in 4 seconds it takes the roof, then the walls and support beams. Their farm is like the inside of a giant blender, everything twirls in motion, cars and farm equipment; clothes, dishes, pictures, toys, blankets, dvd’s, papers, furniture, books, glass, bricks, wood, doors, the family’s farm cat spends 45 seconds in the air, only to be set down, miraculously, free from injury. Then it turned toward the house. In less than 30 seconds it destroys a house that’d been in the family 50 years. Then, silence. The house was gone. Everything was destroyed, except for two grain bins. Adam stands still; despair and astonishment on his face. A radio in the Borchardt parents’ living room transmits emergency information. Jeff, Leslie, their two kids and more than a dozen other extended family members huddle in the living room, watching TV and listening to the radio. “To Demmels, tornadoes move randomly. Their unpredictability is inherently frightening; Demmels use a form of reasoning to make decisions. 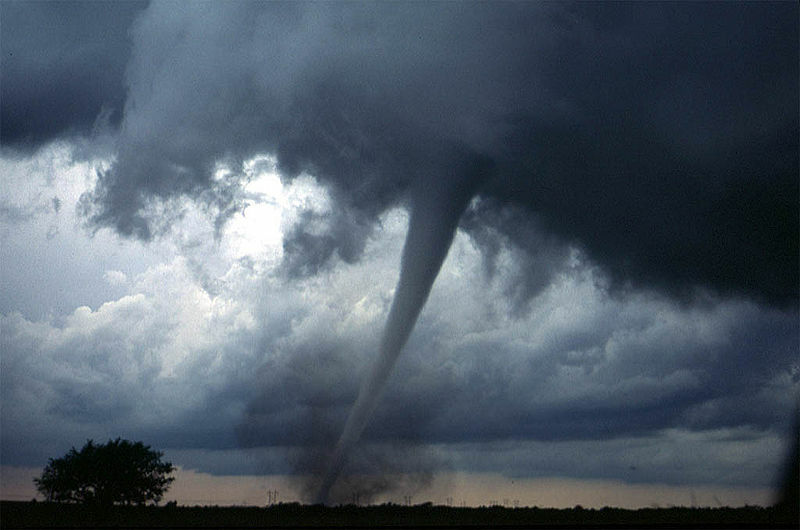 Tornado behavior is not something they can think through logically; and without the technology to determine exactly where they’ll strike, they are vulnerable to them. Demmels have developed rudimentary escape plans, an audible siren system and use their primitive communication systems to alert each other of the wind variations….but what they do to avoid them is unremarkable. What’s notable is what a tornado can do to individuals’ lives, and how the Demmels respond. A tornado destroyed nearly everything this family owned. Everything they’ve spent their lives working to gather. In some cases tornadoes destroy not just a person’s home, but their primary means of providing sustenance and an enjoyable life for their families. We witnessed a case where a tornado destroyed a young family’s home as well as their food-growing operation – which provided their means of generating resources to feed and maintain their way of life. We saw the painful distress and emotions felt by the family. It’s relatively rare to witness such a collective shared feeling of despair, loss, hopelessness. Small groups of people huddle close to each other, hold onto each other physically and share their seemingly catharsis-yielding process of crying. Rarely do adult Demmels engage in this crying process in groups of more than two. They also engaged in communication (they call it praying) with their God; Jesus Christ. Sign up to be a fan of this blog and our Facebook page, and we’ll let you know when the 2nd file is released. We’ll also post it on Facebook and Twitter. The next file, set to be released next week, is centered around New York City on the morning of September 11, 2001.